» Manifesto for World Revolution? 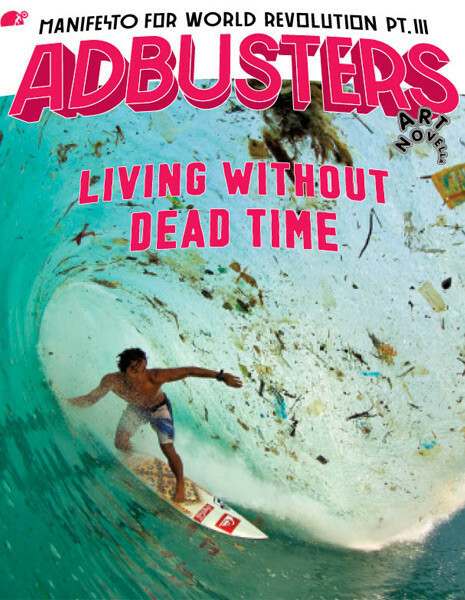 The front cover of the latest edition of Adbusters magazine, is a photograph of a surfer “shooting the tube,” that is, riding his surfboard through the hollow part of a large wave as it crests over itself and makes a tunnel. I was born and raised in Los Angeles, and I have spent much of my life on Southern California beaches… so I know this stuff. The photo is a bitchin image of primo, off the Richter, gnarlatious awesomeness (more obligatory surfer lingo). But trouble is brewing in paradise. Beneath the eye-popping ADBUSTERS masthead that looks like a garish headline from a 60s B-movie sci-fi flick, a mysterious subhead hovers in the wave’s curl like so much kelp and non-biodegradable beach trash, it reads… Living Without Dead Time. It is a revolutionary proclamation from our past, and if we are lucky, from our future. To unlock the profound meaning of the text, one has to read carefully while thumbing through the pages of the subversive rag and “art novella.” Hey, this ain’t no trendy, bourgeois gazette I’m talkin about here, this is a mag that promotes itself as a “Manifesto for World Revolution Pt. III.” Zounds! I think they are actually serious! 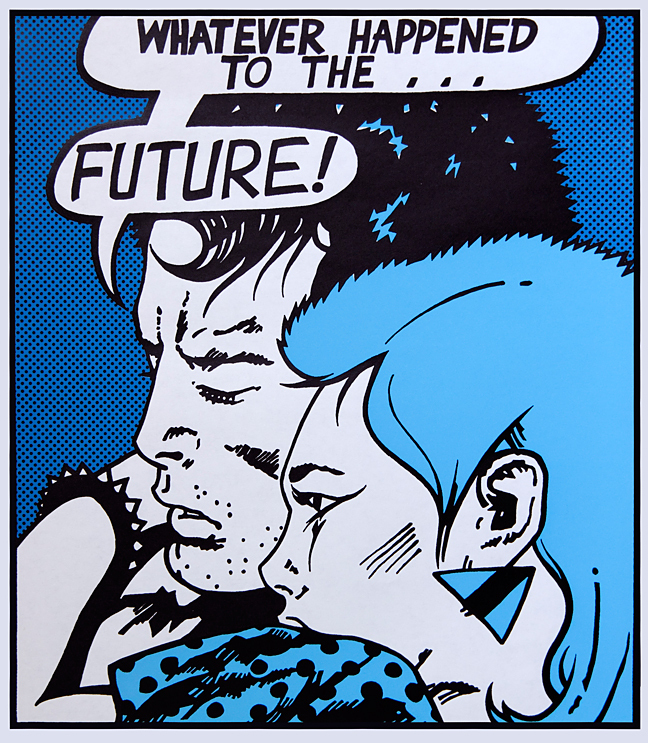 Adbusters contacted me in April seeking permission to reprint my 1980 silkscreen poster, Whatever Happened To The Future! 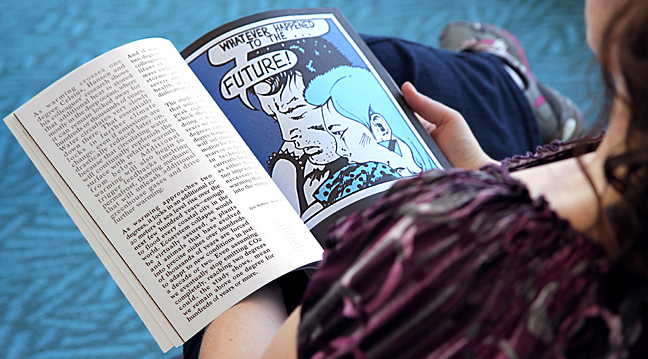 The publication hoped to use my print in a “dystopic photo album” covering events in the 20th-21st century. Ah! Dystopia! I began to smile broadly. "Whatever Happened to the Future!" Mark Vallen 1980 © Silkscreen print. Published in the July/August 2015 issue of Adbusters. When I was informed that anarchism would be the “overarching theme” of the issue, my ear to ear grin was joined with a sinister twinkle in my eye. Advised that the issue would cover, among other things, a “history of uprisings in the 20th-21st centuries” and an essay on “post-post-modernism,” I began to experience mystical self-transcendence! Visions of Guy Debord, the Situationists, the Paris 68 uprising, and those brilliant posters created by the anonymous students and workers of the Paris 68 Atelier Populare galloped through my mind. Of course I did not refuse Adbusters request, which is why I am writing this screed. Whatever Happened To The Future! has been shown at the MOCA Geffen Contemporary in Los Angeles and the Pasadena Museum of California Art, but Adbusters provided the proper historic context for my print. Aesthetically, Living Without Dead Time is a poke in the eye, especially when compared to the à la mode commercial hipster garbage one finds on newsstands these days. 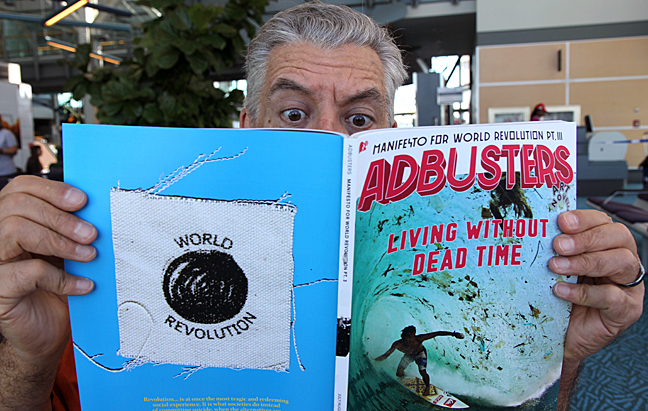 Adbusters’ philosophy of art squares perfectly with that of situationism and its bugbear offspring, punk rock. In fact the publication is somewhat evocative of the rough and tumble punk aesthetic of L.A.’s Slash magazine, that “monthly manifesto of angry refusal” that rose from the polluted urban despair of 1977 to become the city’s first punk publication and an internationally influential journal. I do have some criticisms of Adbusters. I was an initial supporter of the Occupy movement, but soon found it rife with opportunists and social democrats. Bill Clinton’s former U.S. Labor Secretary, Robert Reich, was invited to speak at an Occupy rally outside of L.A. City Hall; Reich’s presence only served to fold people back into the Democratic Party orbit. Likewise, the liberal political commentator and PBS host Tavis Smiley was also invited to address Occupy at L.A. City Hall. With a net worth of some $10 million, Smiley was firmly within the 1% circle that Occupy supposedly opposed. Inviting Reich and Smiley was a major political failing for an ostensibly anti-corporate movement. When Occupy seized the lawns around L.A. City Hall, the campaign degenerated into a fight over the “right” to camp on City Hall grounds; opportunities to make alliances with working people were squandered over a tussle regarding camping. This can only be attributed to naiveté and a lack of actual working class politics. Adbusters excelled at “culture jamming” but hit the skids when laying the groundwork for political opposition against the entrenched financial aristocracy. There is one article in the Living Without Dead Time issue of Adbusters that I must give an emphatic thumbs down to, a piece on the Euromaidan “revolution” that occurred in Ukraine in February 2014. It is a hack-job that does nothing but contribute to the jumble of Russophobic Cold War nonsense presented nonstop by the corporate media. It is a lazy minded essay that plays into the war hysteria that seems to be growing by the day. At Airstrip One, a prole secretly looks at Adbusters before participating in the Two Minute Hate on the telescreen. Photo/E. Goldstein. The Adbusters Ukraine article did not once mention NATO, the EU, or the enforced austerity programs of the IMF and the World Bank. The article paints the crypto fascist Dmytro Yarosh as a popular revolutionary leader, when in reality he is the boss of the right-wing, ultra-nationalist Right Sector organization. Yarosh is on record as having written, “I wonder how it came to pass that most of the billionaires in Ukraine are Jews?”  The word “fascist” is used in the Adbusters article, but it is decried as a Russian propaganda term used to malign the democratic project in Ukraine. Democratic Congressman John Conyers Jr. and Republican Congressman Ted Yoho wrote amendments to ban U.S. troops from training a Ukrainian neo-Nazi militia unit known as the Azov Battalion, which is integrated into the Ukraine National Guard and the army. The Azov flag is a variation of the infamous “Wolfsangel” symbol used by the Waffen-SS. In early June 2015 the U.S. House of Representatives unanimously passed the amendment blocking assistance to the Azov Battalion. I understand that this story broke as Adbusters was going to press, but credible reports of the fascist threat in Ukraine have been circulating for some time, even on this weblog. The Adbusters Ukraine article did not even come close to mentioning this. The socialist stalwarts at Jacobin magazine have a harsh assessment of Adbusters. Published in 2013, their critique titled Adbusted poses some tough questions about the politics and philosophy of the anti-consumerist publication; these are unsettling queries that demand answers. 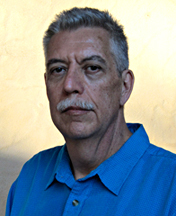 I am not an anarchist, marxist, or a democrat, and I am certainly not a republican. The only identity I embrace is that of dissident artist, my humanist politics are fully on display in my art. To be honest, I am happy to be published by Adbusters, my criticism of them not withstanding, just as I would be gratified to be published in Jacobin. It is all part of the essential conversation so needed at this juncture in history. Signed prints of Whatever Happened to the Future! can be purchased here. Practice for a Russian Invasion: Ukrainian Civilians Take Up Arms. Spiegel Online. April 16, 2014.